After a three game home stand, the Bruins are on the road for the next two: the Canes on Wednesday evening and then the Hawks on Saturday night. Peter gives us an update on how the the Champs have fared so far, all while managing to chirp the Leafs and Habs. “The Bruins have their first few games in the books and so far, it’s been mixed results. Opening night saw the Cup skated around the Garden ice and a banner raised to the rafters. The ceremony was a bit long, but after 39 years of waiting, that’s probably to be expected. That said, I shudder to think of how long the Toronto (44 years and counting) ceremony would be if they ever end their drought. Montreal’s ceremony would no doubt be classy and brief, but I have a feeling that their ceremony to honor the 1 week anniversary of the first ceremony might run longer. Perhaps it was to be expected that the Bruins would be a bit flat after such an emotional couple of days. The result showed that as the Flyers downed them 2-1. Boston followed that game with a much better effort, defeating Tampa 4-1 in a game that could have been much closer if it weren’t for the amazing Tim Thomas in net. He allowed his BFF Martin St. Louis to score on a breakaway, but otherwise slammed the door on the Lightning. The team failed to gain any momentum from the win though, coming out flat once again for a Monday matinee (why don’t we get Columbus Day in California? Heck, I’d even settle for Canadian Thanksgiving) and falling to the Avalanche 1-0, wasting a great effort from #1B goaltender Tuukka “Thanks Toronto, Pt. 1” Rask. “So, after 3 games, the Bruins stand at 1-2-0. On the bright side, they are still the reigning Stanley Cup Champions (I told you I won’t stop bringing that up) and look to have a very strong team again this season. On the downside, they are showing definite signs of a Cup hangover and need to pull it together or the points they lose now may come back to haunt them in the spring. So, let’s take a look at some pluses and minuses. 1. 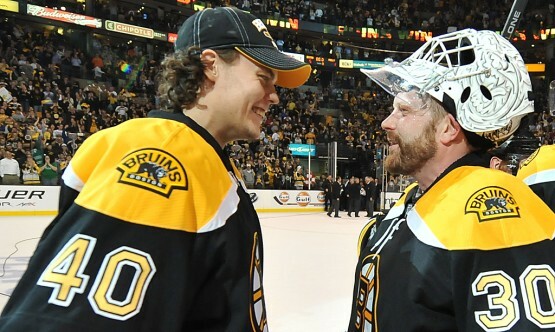 The Goalies: Thomas and Rask have both looked great and have only given up 4 goals in the 3 games. Rask was his calm, steady self against the Avs and Timmy was flying all over the crease making saves however needed in his 2 starts. The Bruins at least know they have one area they don’t need to worry about. Additionally, Thomas with his ’70s moustache (and occasionaly, some alternative beard styles) and Rask with his boyish (if somewhat elfish) good looks can combine to capture the hearts of a broad range of the gay hockey community. Not a bad 1-2 punch at all. 2. The Kids: Brad Marchand and Tyler “Thanks Toronto, Pt. 2” Seguin have arguably been the Bruins top 2 forwards. They lead the team in points with 3 each and both have been flying around the ice making some great plays. Their speed and skill are exactly what the Bruins need to compliment their hulking, but lumbering top line. Consistency is tough for youngsters though, so we’ll see how they do. 3. 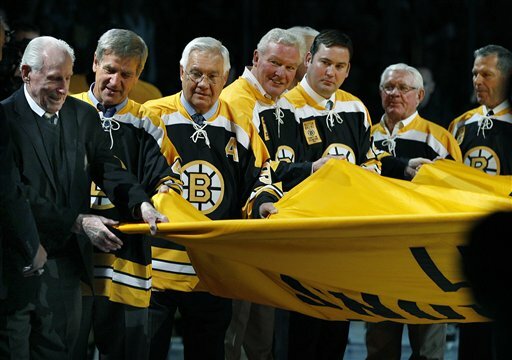 The Cup: Seeing the Cup in Bruin hands on Boston ice and legends like Orr, 93 year-old Schmidt and Bucyk in the Building is enough of a positive to make up for a couple of losses so early in the season. 1. 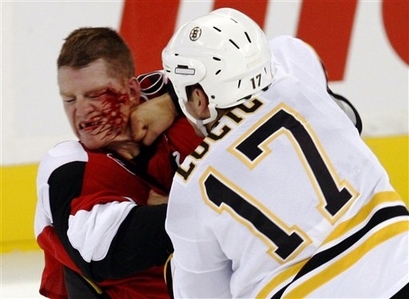 The First Line: The Lucic-Krejci-Horton line is expected to hit, fight and score. They set the tone for the Bruins with their blend intimidation and skill, but were largely invisible in the first 3 games. Horton, coming off his concussion last spring, should be cut some slack, but Lucic has looked fairly uninterested, which is inexcusable. If he’s not scoring goals, Milan needs to be doing more of what is pictured here. 2. Injured Krejci? : The struggles of the first line may be a moot point. 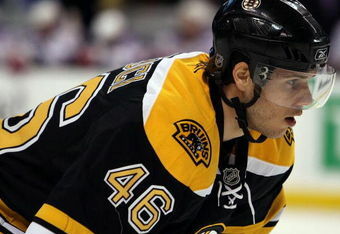 Krejci left practice Tuesday with an undisclosed injury and will miss at least the start of the coming road trip. Boston’s strength at the center position (Krejci, Bergeron, Kelly, Campbell, Peverly and Seguin can all play center) will help cover up for the loss of Krejci, but losing the guy who led the playoffs in scoring will hurt a team that has struggled to score so far. 3. Emotion: For the Bruins to go through 3 games in their home building, 2 of which were against teams they faced in the playoffs last year, and have a fairly complete lack of physical play and zero fights is not good. The Bruins are a team built to play a physical style. 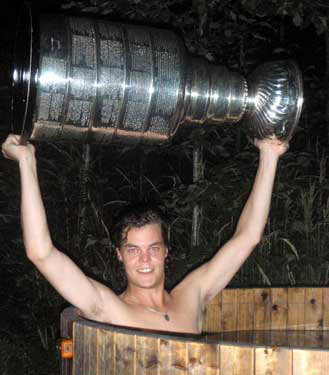 Cruising around the ice thinking your Stanley Cup ring is going to score goals and win games for you isn’t going to get it done. 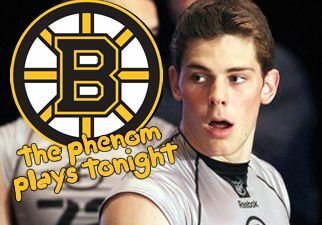 The Bs need to bring a whole lot more emotion to the rink going forward. This entry was posted in Boston Bruins and tagged Boston Bruins, Davis Krejci, Stanley Cup Champions, Tim Thomas, Tuukka Rask, Tyler Seguin. Bookmark the permalink.